THE SCENE: Cool, but not too cool. Just right. Like porridge maybe. F3 WELCOME & DISCLAIMER: Given. Also, “I’m not a professional” was restated a few times. The Monthly Rucking Challenge this month is called Lucky Number 7. We did the first of the 7 sets. See details on the GORUCK site. 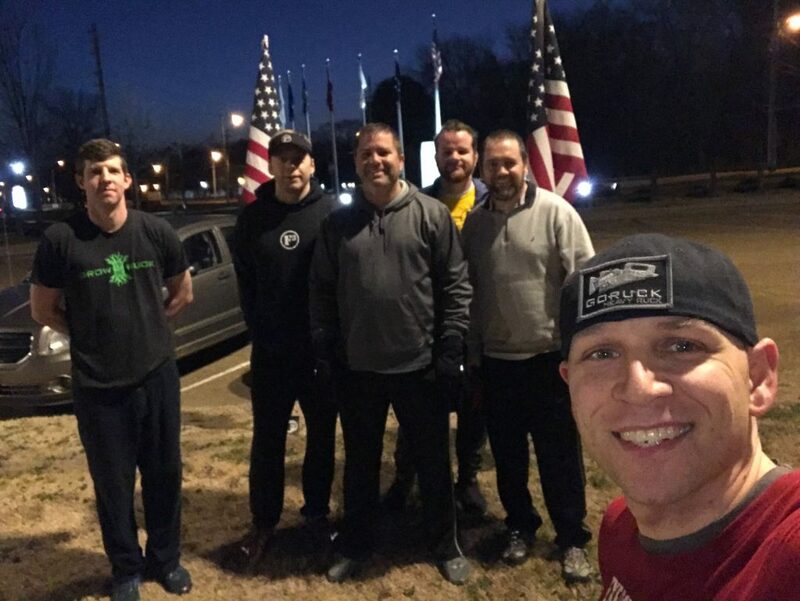 We would ruck .10 miles around the parking lot and then stop and do a set. Rinse and repeat until we hit 10 sets. Wall Builder, Choker, Flobee, Orange Julius, The Streak and even Big Mac (FNG) all took turns leading some of the sets. Choker led us in ABCs. 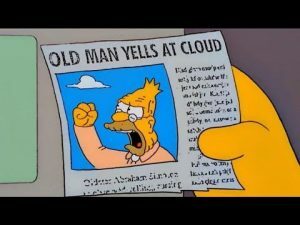 I’ve been doing F3 for just over a year now (first day was 4/2/2018), so I thought I’d share some reflections on a year of F3… first off, I’m in far better shape now than I was… but I’m not at the front of the group by any means. And that’s okay. Because the second F has been an incredible benefit – fellowship. I’ve got a group of men that I can come to that routinely push me to do better, in all aspects of life. Thank you for that. While I’m talking about fellowship, I have to also reflect on the third F – Faith. Something that has really struck me is the intersection of fellowship and faith. I’ve been incredibly grateful for seeing how the F3 community puts their faith to practice. Even if I’m not able to participate in an activity, this group is actively bettering their community, too. Whether it is cleaning up someone’s house, volunteering to paint or clean, or whatever, that is just the type of men that I see in F3. So thank you for putting your faith into practice and also for encouraging me and helping me to grow both spiritually and physically. 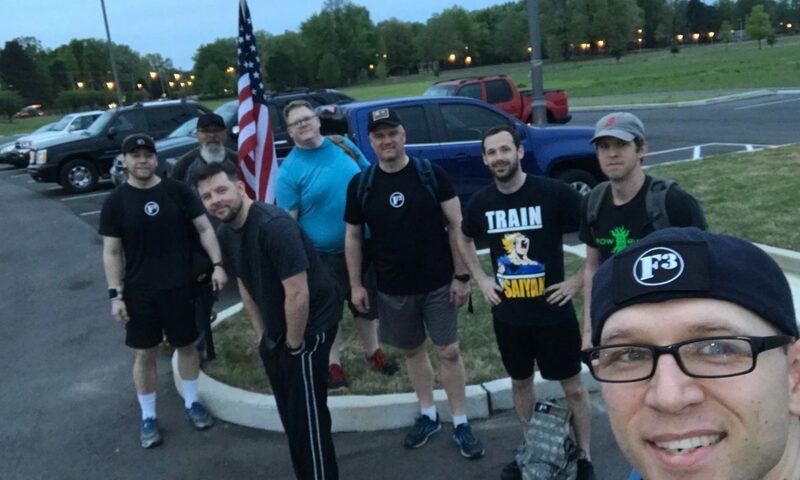 I wanted to give some of the PAX the opportunity to lead part of the workout and they did a great job… what I didn’t expect was that even our FNG would be willing to step up and lead. And he did great! THE SCENE: Mid 30ish windy and cool morning. F3 WELCOME & DISCLAIMER Done. Merkins 10, Wide-arm merkins 10, Diamond Merkins 10, Uneven merkins on the curb 10 left and 10 right. THE SCENE: A scosche colder than YHC spected. Arrived just in time to fist bump The Streak on his way out because, in his own words, his “feelings weren’t working” or something like that. I’m sure I said some stuff about that. Wheelbarrow to first light post and do 10 high knees jumps. Wheelbarrow to next light post and do 10 jump lunges. Crabwalk to next light. 10 high knee jumps. Dora 123 using 150 Squats, 150 BBSU, and 150 Flutter Kicks. Partner travels 40 yards to guard rail and knocks out 10 Derkins. 140 yard sprint further up the back road to establish plenty of distance for an Indian run back to startex. Orange Julius SMOKED YHC on the sprint. TCLAPS, homey. But above all, my brothers, do not swear, either by heaven or by earth or by any other oath, but let your yes be yes and your no be no, so that you may not fall under condemnation. A staple mantra in YHC’s household is “Say what you mean and mean what you say”. Why is it so difficult for us to simply say yes or no? Perhaps because we like the ambiguity of not having to follow through with what we say. Or maybe because its easier to put off a tough decision for a later time. We may flirt with tendencies towards deceitfulness and not want others to know our true intentions. Whatever the reason, God expects His children to be clear cut with their words. We aren’t to wade in the subtle grey areas of ambiguity with our words. Rather we are to be people who speak plainly, clearly, and truthfully so that we aren’t condemned by our own words, so we don’t mislead others, and so that we speak truth into other peoples lives. Prayed for baby Shepherd’s recover as well as strength and comfort for mommy and daddy. Sorry I had your compressor and nail gun so long, Woodpecker. Pass the Potatoes: PAX got in a circle facing outwards. Every other person had a tater (CMU). Taters were passed clockwise for several rounds and then counterclockwise for several rounds. Pass It High, Pass It Low: Circle was spread out a bit and PAX faced inwards. Each PAX had a CMU on their left. Pick it up, raise it overhead, put it down on the right. Pick it back up, over your head, back down on the left. Rinse and repeat several times. Sprint to end of parking lot. Run backwards back to Start. Early finishers do burpees until all in. The only thing more indecisive than a squirrel in the middle of the street is a Christian man, sometimes. Temptation is the middle of the street. Stay out of the street. Absolutely perfect conditions. 45ish degrees, clear skies, dry ground. Just what I needed to start this week off right. Today’s playlist. Mosey to smooth area of parking lot. Bear Crawl increasing lengths while doing decreasing sets of burpees. Try to complete the circuit before the end of “Stairway to Heaven”. Bear crawl the width of 1 parking space and back. 7 burpees. Bear crawl the width of 2 parking spaces and back. 6 burpees. Bear crawl the width of 7 parking spaces and back. 1 burpee. Partner up and complete the following as a team: 100 merkins, 200 BBSU, 300 squats, 400 flutter kicks. P1 performs the exercise while P2 runs a merkin suicide. 3 cones were set out with 5 parking spaces between each. P2 runs to first cone, performs 1 merkin, returns to start. Runs to 2nd cone, 2 merkins, returns to start. Runs to 3rd cone, 3 merkins, returns to start. Flapjack with P1. We all know the DRP means that you have to stay consistent in order to Accelerate your fitness. The other areas in your life need consistency as well, including your relationship with your M. If things are going well, that doesn’t mean you can take your foot off the gas and coast along forever – if you aren’t Accelerating, you’re decelerating. Kotters to Sleep Number and The Streak, back after their vacations. Please pray for baby Shep. THE SCENE: Crisp and cool. Thankfully, not raining. 5 Merkins, mosey, 10 merkins, mosey, 15 merkins, mosey, 20 merkins, mosey, 25 merkins. Cycle of 20 dips, 15 Carolina Dry docks, 15 dips, 10 burpees OYO. 25 Squats, mosey, 20 Squats, mosey, 15 Squats, mosey, 10 Squats, mosey, 5 Squats, mosey. BBS IC 15, WWI Situps IC 15, 4-Count Flutter Kicks (Commie), 60 Second Plank. The point is that prayer is the way to find future grace for a well-timed help. This grace always arrives from the “throne of grace” on time. The phrase, “throne of grace” means that future grace comes from the King of the Universe who sets the times by his own authority (Acts 1:8). His timing is perfect, but it is rarely ours: “For a thousand years in [his] sight are like yesterday when it passes by” (Psalm 31:15). When we wonder about the timing of future grace, we must think on the “throne of grace.” Nothing can hinder God’s plan to send grace when it will be best for us. Future grace is always well-timed.